Over 300 people have died and lakhs displaced in the floods and landslides caused by the monsoon rains since August 8 across Kerala. The Indian Navy rescued nearly 17,000 people caught in gushing waters in flood-ravaged Kerala, a Defence spokesperson said here on Monday. Navy personnel who were part of the rescue mission code named “Op Madad” in Kerala, displayed their skills and courage in rescuing thousands of people, Commander Sridhar Warrier, the spokesperson in Kochi, said. 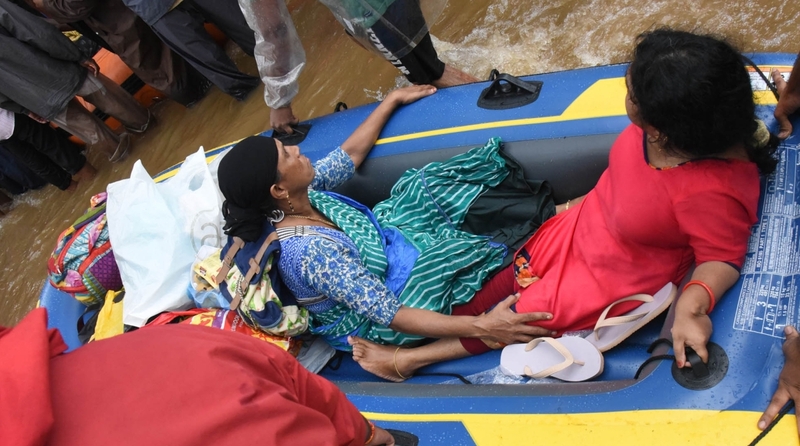 In all, the Indian Navy rescued a total of 16,843 people, of which 1,173 were airlifted while 15,670 were rescued by teams using Gemini boats after Kerala experienced unprecedented rainfall, which resulted in widespread flooding, he told PTI. “Such was their efficiency that in fact, no deaths by drowning were reported in any area where Naval teams systematically organised their rescue efforts,” he said. Warrier said a robust and efficient Command, Control and Logistics Organisation of the Southern Naval Command (SNC), coordinated by Joint Operation Centre (JOC), ensured naval personnel deployed in the worst-hit areas were utilised efficiently to rescue maximum number of people. Based on inputs from the state administration, as well as feedback from the teams on ground, careful planning of the utilisation of resources available with the Command was done and teams were deployed in the general areas where distress calls were most concentrated, he said. “Once the resources available with the Southern Naval Command in terms of Gemini boats and divers were found to be falling short, additional resources were sought and promptly received from other Naval commands,” Warrier said. 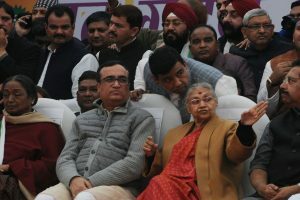 SNC Headquarters also coordinated with the Air Force headquarters for airlift of personnel and equipment from Mumbai and Visakhapatnam to Kochi. He said deployment of teams to inaccessible areas was mostly done by airlift and even this was extremely difficult as landing grounds for the aircraft were not readily available due to inundation of most areas. The teams were dropped off at the closest locations and, thereafter, they moved by boat/road to the affected areas. Naval aircraft operated from the Naval Air Station INS Garuda and were deployed from Chalakudy, Thrissur to Ayroor, Pathanamthitta to airlift survivors from locations inaccessible by road, the spokesman said. Some of the rescued people were relocated to safe sites and the rest were brought to Naval relief camps set up in the T-2 Hangar and Naval KG School inside the Naval Base, he said. As the waters receded, de-induction of 92 teams and over 500 men began after obtaining clearance from the state government. He said Wayanad district was the first to be severely hit as a result of the incessant rains, which resulted in flooding and landslides. Consequently, on August 9 in view of the worsening situation and the challenges faced by the state administration, the Southern Naval Command launched “Operation Madad” to facilitate rescue and relief efforts to the affected areas, the spokesman said. Initially, Op Madad State III was executed on August 9, which was raised to State II on August 10, wherein majority of rescue and relief teams were brought to full readiness and kept on standby for immediate deployment, he said. The rains intensified considerably from August 14 which resulted in waters in major dams crossing the danger levels and forcing the state government to order opening of the shutters of some 35 of these 39 dams. “This resulted in major flooding at Ernakulam, Kottayam and Pathanamthitta districts mainly due to opening of shutters of four dams in Idukki district and Kakki Dam in Pathanamthitta district and led to massive increase in water levels and flow in Periyar and Pamba rivers,” he said. Since the situation developed over a period of ten days, the naval deployments were also carried out in phases. The Joint Operations Centre (JOC), Kochi became the nerve centre during the conduct of Operation Madad. The JOC was augmented with a Planning and Coordination Section, rescue coordination cell within the operations room and a team muster and kitting up point at the ground floor of the JOC building, in order to quickly deploy teams as per requirement, the spokesman said. Deployment of rescue teams peaked on August 19, wherein a total of 92 teams were deployed simultaneously across all affected areas, he added. JOC was also the nerve centre for planning and coordination with all other Services and state agencies, and carried out this task seamlessly to maximise rescue efforts on the ground.